Melisandre's Flames -- New sock pattern design! "The night is dark, and full of terrors." Melisandre, the Red Priestess from Asshai, is Stannis' sorceress adviser. 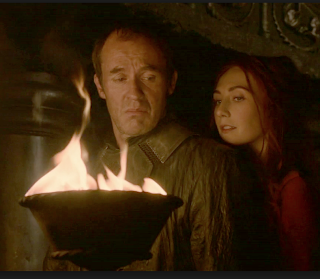 She claims to see the prophecies of the Lord Of Light in flames, and has converted the stoic Stannis to her religion. She gives him information to help his cause, to claim his rightful seat on the throne in Westros. Since I did the socks for Stannis, I couldn't get the idea of doing a sock pattern for Melisandre, out of my head. But what stitch, or combinations of stitches to use? Melisandre reminds me of a beautiful snake. Her body language from the R.R. Martin books is very sensual, slinky. She has an almost hypnotic power over those that come in contact with her, or she inspires fear and distrust in those who worship the old gods or the gods of the Seven. So, with this in mind, and the fact that Melisandre burns with an inner fire, I wanted a stitch pattern that is reminiscent of flickering, twisting flames, yet a little bit lacy hinting at her seductiveness. And I think I have found it! But what about the yarn? I looked at A LOT of different shades of red and orange, you know, to evoke that whole fire thing. I wasn't really satisfied until I got an email sale alert from Webs. 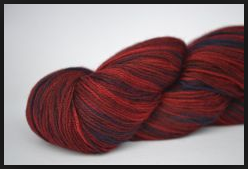 And low and behold, I have found the perfect yarn colorway that totally reminds me of Melisandre! Oddly enough, it is a Cascade Heritage Paints which was the yarn that captivated me for Socks For Stannis. The colorway is 9928 "Dark Sunset." I love how the different colors bleed into each other. "Game of Thrones" Season 3, episode 2 is on tonight. And guess what? The night is dark, and full of knitting. I'm so eager to see your new sock pattern! I'm still finishing season 2 of GOT, but I'm hooked. Thank you! I'm so hooked on GOT too. Have you listened to the audio books? That's what I usually listen to while knitting. LOVE 'EM!